TruexCullins Architecture + Interior Design is pleased to announce its two recently completed border patrol stations for the United States Customs and Border Protection in Vermont have received LEED® Gold and Silver certification from the Green Building Certification Institute (GBCI). LEED® (Leadership in Energy & Environmental Design) is a rigorous green building certification program that recognizes best-in-class sustainable building strategies and practices. To receive LEED® certification, building projects must both satisfy prerequisites and earn points to achieve the different levels of certification. 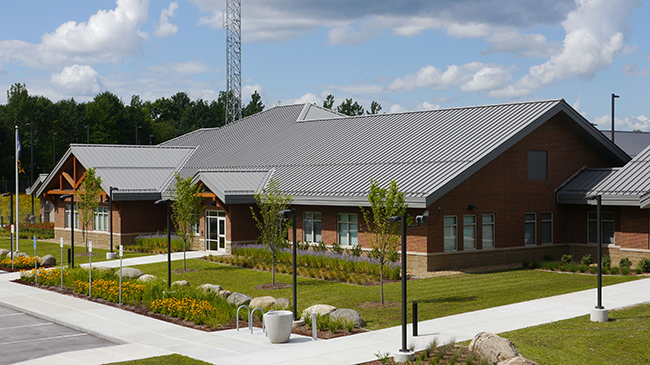 The facility in Beecher Falls, Vermont earned LEED® Gold Certification and the border patrol station in Swanton was awarded LEED® Silver Certification. Green features include: geothermal heating and cooling, low-flow water saving plumbing and fixtures, a high-performance building thermal envelope and use of recycled and locally-sourced regional construction materials.